Module A-101-1 is a special multitype filter based on an idea by Nyle A. Steiner (published in Electronic Design, issue 25, December 1974, page 96 ff). The circuit uses the standard non-inverting amplifier filter design. Different filter types (low pass / LP, band pass / BP, high pass / HP) are realized by injecting the audio signal into different points of the circuit and using a common output for all filter types. 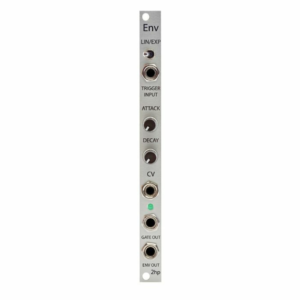 One may feed three different audio signals into the filter simultaneously. Each signal is filtered correspondingly (LP resp. BP resp. HP) and the sum of the three filtered signals appears at the output. Of course it is possible to feed the same signal to all three inputs. 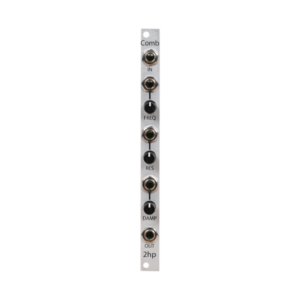 In this case one obtains different combinations of LP/BP/HP according to the settings of the three input attenuators for LP/BP/HP. Even a Notch filter is possible (not available in the original design). The filter inputs are normalled, i.e. the BP input is connected to the LP jack socket provided that no cable is plugged into the BP socket (same applies for HP/BP inputs). In contrast to the original circuit vactrols are used instead of diodes as variable resistors for frequency control of the filter. Due to the”crooked” response of vactrols the filter has not an exact frequency control standard (like V/Oct). The inevitable tolerances between different vactrols will lead to an individual sound of each module and individual resonance behaviour. Even the resonance control is realized with vactrols. Consequently this parameter is voltage controlled, too. Resonance can be increased up to self-oscillation. Resonance and consequently self-oscillation may vary with the filter frequency because of vactrol tolerances. 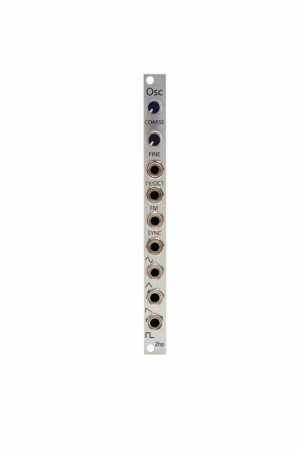 A special feature of the module are the two audio outputs. Out 1 is the output of the original circuit. In the original circuit by Nyle A. Steiner the output level was distinctly dependent upon the resonance (higher resonance = higher output level). Out 2 compensates this behaviour by the usage of an additional vactrol that is connected in series to the vactrol that controls the resonance. 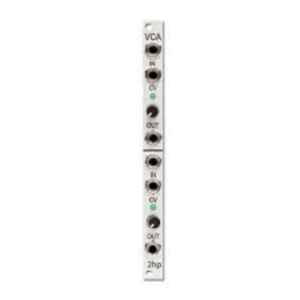 This additional vactrol forms an attenuator (or simple VCA) that approximately compensates the level increase for higher resonance settings. Two LED displays show the current frequency and resonance setting. The LEDs are connected in series to the LEDs inside the vactrols and show consequently the LED illumination inside the vactrols. Module A-101-1 is a special multitype filter based on an idea by Nyle A. Steiner (published in Electronic Design, issue 25, December 1974, page 96 ff). The circuit uses the standard non-inverting amplifier filter design. Different filter types (low pass / LP, band pass / BP, high pass / HP) are realized by injecting the audio signal into different points of the circuit and using a common output for all filter types.